There is a lot that goes on at Pordenone. 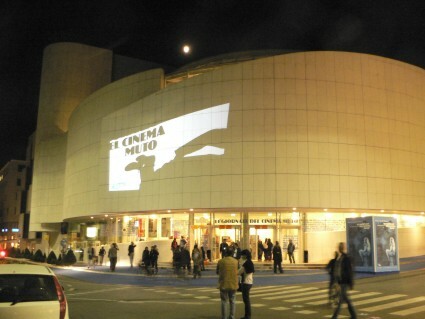 While the main film shows takes place in the Verdi theatre, in three sessions (from 9.00, 14.30 and 20.30), supplementary screenings (often 16mm or video formats) take place in a side theatre, the Ridotto. This is also the venue for the weekly talks given to the Collegium, a gathering of selected students who are attached to the festival for the week and write a paper at the end of it. 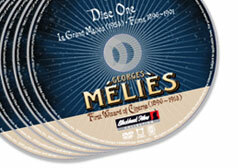 There are masterclasses each day, on the art of combining music with silent film. There is a book fair, which has book launches every evening. There are assorted special events and lectures, notably the Jonathan Dennis Memorial Lecture (named after a much-admired New Zealand film archivist who died too young), which this year was given by Eileen Bowser. And there are meeting of specialists groups, such as Domitor and Women and Film History International. In between all this, it is essential to take time out and sit at one of the pavement cafes (the Posta, opposite the Verdi, for choice), with cappucino at the ready, waiting for the world to stoop by for a chat. The world invariably does. Pordenone is the ideal spot for learning about others’ projects, exchanging ideas, hatching schemes. So, hello to all those I met – including a smattering of Bioscope regulars – and look out for the fruits of projects large and small, maybe, one day. Some of these took precedence over the films shown, hence some of the gaps in the reports (which I hope those who saw the films may rectify by adding their impressions to the comments, please). And so to Monday 6 October. Out there in something called the real world stockmarkets crashed, banks crumbled to dust, and you wondered first if there would be any airlines to fly us back, and then if that would really be such a bad thing. In our world, we had Jacques Feyder and, to these eyes, the interesting issue of servants. There were four of Feyder’s earliest films on show, all part of the ‘French touch’ strand. Des Pieds et des Mains (1915) told its romantic tale ingeniously through shots of hands and feet alone; Tetes de Femmes, Femmes de Tete (1916) had two women wittily getting the better of the errant husband of one of them; Un Conseil d’Ami (1916) echoed this by having a man puzzled by his social failure advised by a wiser, older man; and La Faute d’Orthographe (1919) told a comic tale of an ambitious officer worker let down by his inability to spell, his salvation unexpectedly coming in the form of a burglar at the office who corrected the man’s spelling on an application form while about his own business. Servants are only machines made to wait upon people – and to give evidence in the divorce courts. But I wanted to know where the servants went once they respectfully slipped out of shot. There were other worlds out there, to the edges, away from the selfish concerns of the characters on which the films chose to concentrate. I enjoy picking out these counter-narratives, the stories one can imagine running through the film that were not in the filmmakers’ conscious mind – or perhaps they were, as these early Feyder films were notable for the precision with which shots were populated and framed. In two of the films, the great Françoise Rosay – towering figure in French cinema, and of course Feyder’s wife – appeared as a figure in the background; in one a guest at a party, on another a passenger on a bus. These were films that encouraged you to look closely, films to savour. 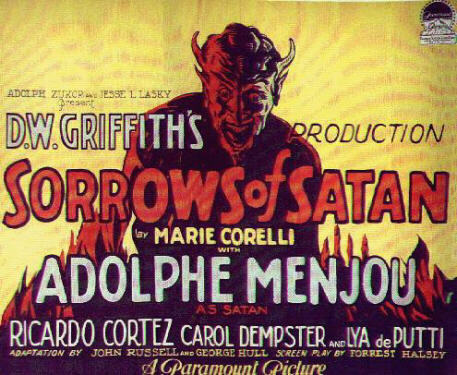 And then it was the Griffith of the day, The Sorrows of Satan (1926). As I’ve said, the late Griffiths were films I’d managed to avoid up til now, and I came to them with prejudices gleaned from the standard film histories. Re-reading some writings subsequently, I can see that these films have always had their champions, but the general audience reaction at Pordenone was one of genuine surprise that the films were so good. To my mind, the best of them was The Sorrows of Satan. The omens were not good. A tale of young love thwarted by the appearance of Satan himself, taken from the novel of the ludicrously moralistic Victorian novelist Marie Corelli, filmed by a man whose lapses into Victorianism show him at his worst. The startling opening shot of angels and devils at war above a giant heavenly staircase may have confirmed the worst fears of some, or else alerted us to a sense that here was a film with the courage of its convictions and the skill to display them. The two lovers are played by Ricardo Cortez, as an aspiring writer living in a garret, and Carol Dempster (on fine, mannerism-free form – her final screen role), another aspiring writer living next door. The relationship between the two is built up gradually, with a fine sense of pace and telling detail (as was evidenced in the best parts of Sally of the Sawdust). Then Cortez rages against his fate, specifically against God, and suddenly Adolphe Menjou has appeared at his side. This was one of the best appearances in a film that I can remember. We know he’s the Devil, but he’s also Menjou at his mostly Gallically elegant, fresh from A Woman of Paris, looking just so pleased with everything and in total control of all about him. He leads Cortez away from Dempster and into a debauched social life (excellent change in visual scale), culminating in marriage to ultra-vamp Lya de Putti, which anyone could have told him was going to end in tears. Again and again there were striking camera set-ups (clearly inspired by German cinema), with telling composition and atmospheric, apposite lighting. It was all terribly moralistic, of course, but entirely justified within the parameters it had established. Mercifully we weren’t shown Menjou turning into his Satan self – it was far more effective to show just the winged shadow and the horror on Cortez’s face. In the end, when Satan has been shaken off, the lovers are reunited, but there is no other reward. Neither becomes the great writer each aspired to be – forgiveness is all. I thought this was a great film. I made a tactical error in bypassing Gloria (1921), a commemorative record of ceremonies held to mark the death of 650,000 Italian troops in the First World War, which reports suggest was extrordinary. 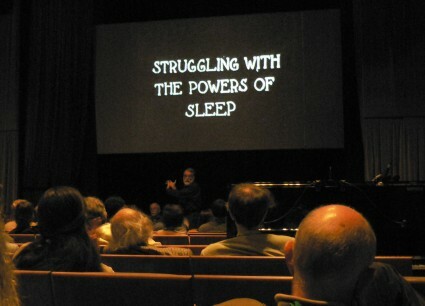 Instead I went to one of the Collegium sessions, on theatre and film. There were interesting short addresses given by David Mayer, Phil Carli and especially Frank Scheide, on the relationship between vaudeville/variety and film, but I wasn’t entirely sure what the Collegium (students attached to the festival for the week) were expected to get out of it all. Speaking to some past and present Collegium members, it seems that culmulatively the concept works, as they learn from each other, and of course experience the Giornate in all of its richness over the week. The Corrick Collection is a collection of short films collected by an Australian family of touring entertainers from early in the last century. The first part of the collection was presented last year; in part one of the remainder, we saw a selection of real gems – an unidentified record of the coronation of Edward VII in 1902; Pathé’s 1903 tableaux-like Marie-Antoinette, featuring a gruesome scene where she is taunted in prison by a severed head on the end of a pole; a 1908 Pathé travel film of life in Sudan; and a dazzling trick film with cut-out figure made by British magician-turned-filmmaker Walter Booth, The Hand of the Artist. This was followed by a hour-long documentary on the work of the festival’s great discovery, Alexander Shiryaev, but we’ll cover him in full in the report on Day Seven. Tactical error no. 2 was missing The Kiss of Mary Pickford (1926), the delightful Soviet comedy inspired by the visit of Fairbanks and Pickford to the USSR, though I did see it once years ago. For many that I spoke to it was one of the highlights of the festival. In the evening, we went on holiday. Maciste in Vacanza (1921) was one of a great number of films made in Italy following the huge success of Cabiria which were vehicle for the strongman from that film, Maciste, played by Bartolomeo Pagano. Here were saw Pagano more or less as himself, a strongman film-star beset by fans wherever he goes, who needs urgently to go on vacation to recover his strength. So he does, in a little car which he rather disturbingly refers to as his wife, though he is still pestered at every turn (‘Maciste, please move my cottage nearer the town’ asks an elderly countrywoman). While the film was in this self-referential mood it was great fun. Then it got caught up in a mystery plot set in a castle with too many intertitles and rather lost its momentum, but overall it was a happy piece of fun. The film was shown, along with other Italian silents at the festival, in tribute to the late film historian and Pordenone stalwart, Vittorio Martinelli. So we also saw a sonorised nature film on the life of the cricket, from nature film specialist Roberto Omegna, and a travelogue of Sicily. And so ended Day Three for me, missing the late night French film Paris en Cinq Jours for a discussion on film archives and their collaborative future in the UK. Keep your eyes peeled for Day Four, where we will see the evils of war, the first films ever made, a Japanese actor playing a Hindu living in Scotland, and why Keystone represents the spirit of America. It looks like we made the same choices that day; I too ducked out after the Maciste film as the ‘Life of a Wood Cricket’, which I hoped would be a delightful Starewitch-style animation, turned out to be the real thing, and, it seemed, in real time…..
One film not mentioned though was the restored Manhatta; terrific imagery of the buildings and people of 20’s New York – would you consider it avant garde or an abstract travelogue ? – the print seemed a bit dupey, but I was right under the huge screen, and apparently only one archival print survives. Applause here too (again) for Donald Sosin’s score; it screamed early 20thC US classical – I thought it was a period score before I read the credits. Fitted the film like a glove. I liked the cricket film. They did what crickets do. What else can you hope for? I missed Manhatta, because I have seen it a few times. I like ‘abstract travelogue’ as a description, but many of the so-called avant garde films of this period don’t really fall so easily into brackets as ‘avant garde’ – which is their great virtue. I also missed the DVD screening of Blackmail with Neil Brand’s orchestral score(as premiered at Bologna). Don’t what the future of that might be. I think Donald Sosin was on top form throughout the week. All of the piano playing is of such high standard now (I’ll expound on this in a later diary entry), not just appositely musical and knowledgeable musical. We’re spoiled. I agree about the standard of the piano playing; in alphabetical order Messrs Brand, Buchwald, Carli, Horne, Sosin, Sweeney and Thibaudeau are all at the top of their game. I’ve been saying for a few years now, to anyone who’ll listen; the Golden Age of Silent Movie Accompaniment?? I think it’s now, I think we’re in the middle of it. No real evidence for it, just a feeling that back in the day, talents such as these would have been head-hunted into musical direction in larger cinemas with larger ensembles; the type of cinema with a solo pianist would be relying on players switching from one cue-sheet suggestion to another. A skill in itself, but not at the level of artistry of the above gents and some of their colleagues not at Pordenone this year. Would such talents have been recognised back in those days, or are they particular products of our own times?